There’s something that feels very familiar about Mitchell Creek Inn. Maybe it’s the towering trees that seem to reach out in welcome as you pull in for a visit. Perhaps it’s the slow-moving creek that seems to whisper, “relax, take it easy” as it winds through the property. 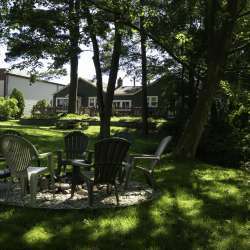 It could be the place itself; a charming, easily accessible inn with cabins that feel like the up north escape you always dream of. It could also possibly be the aroma of fresh-baked cherry coffee cake that, on certain mornings, hangs temptingly in the air. There’s a lot to love about Mitchell Creek Inn. 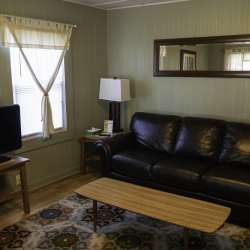 The home cooked breakfasts, including Amanda’s famous cherry coffee cake or rhubarb/strawberry crunch, the clean, comfortable, and surprisingly spacious rooms. The close by convenience of all Traverse City and the surrounding area has to offer. Perhaps the most important factor to love is that familiar feeling of family that seems to beckon you back, time after time.